In a newly published study, researchers have demonstrated a new “enabling technology” that uses a class of chemicals called Lewis acids to help transform carbon dioxide into acrylate, a valuable commodity chemical used to make many everyday items. Providence, Rhode Island (Brown University) — A key advance, newly reported by chemists from Brown and Yale Universities, could lead to a cheaper and more sustainable way to make acrylate, an important commodity chemical used to make materials from polyester fabrics to diapers. Since the 1980s researchers have been looking into the possibility of making acrylate by combining carbon dioxide with a gas called ethylene in the presence of nickel and other metal catalysts. CO2 is essentially free and something the planet currently has in overabundance. Ethylene is cheaper than propylene and can be made from plant biomass. There has been a persistent obstacle to the approach, however. Instead of forming the acrylate molecule, CO2 and ethylene tend to form a precursor molecule with a five-membered ring made of oxygen, nickel, and three carbon atoms. In order to finish the conversion to acrylate, that ring needs to be cracked open to allow the formation of a carbon-carbon double bond, a process called elimination. That step had proved elusive. But the research by Bernskoetter and his colleagues, published in the journal Organometallics, shows that a class of chemicals called Lewis acids can easily break open that five-membered ring, allowing the molecule to eliminate and form acrylate. Lewis acids are basically electron acceptors. In this case, the acid steals away electrons that make up the bond between nickel and oxygen in the ring. That weakens the bond and opens the ring. He calls the finding an “enabling technology” that could eventually be incorporated in a full catalytic process for making acrylate on a mass scale. “We can now basically do all the steps required,” he said. From here, the team needs to tweak the strength of the Lewis acid used. 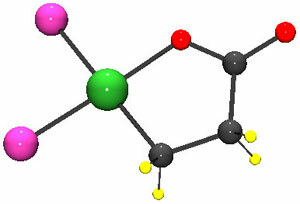 To prove the concept, they used the strongest acid that was easily available, one derived from boron. But that acid is too strong to use in a repeatable catalytic process because it bonds too strongly to the acrylate product to allow additional reactions with the nickel catalyst. The ongoing research is part of a collaboration between Brown and Yale supported by the National Science Foundation’s Centers for Chemical Innovation program. The work is aimed at activating CO2 for use in making all kinds of commodity chemicals, and acrylate is a good place to start. Other authors on the paper were Dong Jin and Paul Willard of Brown and Nilay Hazari and Timothy Schmeier of Yale. Be the first to comment on "“Enabling Technology” Helps Transform Carbon Dioxide into Acrylate"